Nico's 1974 album, The End, was her fourth solo release, her fifth collaboration with John Cale (including The Velvet Underground & Nico) and her third with him as producer. John Cale had signed a new contract with Island records in 1973 and Nico was also brought to the label by A&R man Richard Williams, although The End would be only full album she recorded for the label. The album was recorded in 1973 at Sound Techniques in London, with John Wood (who had also engineered the earlier Desertshore) and Cale. He chose Brian Eno and Phil Manzanera of Roxy Music to work on the album with him; between them they provided the entire instrumental framework for Nico and her harmonium. The album was recorded quickly; the arrangements were mostly Nico’s own and Cale was impressed by the new way she enriched her phrasing with Arabic flourishes which he was able to complement with Middle Eastern style percussion. The End, remastered here for the first time, was a definite move away from the stark, almost classical sound of Nico and Cale’s collaboration on The Marble Index, and the folk motifs employed on Desertshore. It completes her glorious triptych with John Cale. Island included Nico on the bill of the specially-prepared publicity concert which also launched new LPs from Cale, Eno, and Kevin Ayers. The concert took place at London’s Rainbow Theatre on June 1, 1974 - this date became the title of the resulting live album released only three weeks later. Nico performed two tracks from her new album, The End and a previously unreleased version of Das Lied der Deutschen. Both tracks can be heard on this new edition. Nico also had a champion in John Peel, appearing twice on his programme during this period. Her first Peel session was recorded on 2 February 1971, ostensibly to promote Desertshore, but she debuted one new song, Secret Side, which was later recorded for The End. This session was released on vinyl by Strange Fruit but has long been deleted. Peel invited Nico on the programme again on 3 December 1974. The recording of this session, along with the tracks Secret Side and The Valley of the Kings, which she performed on The Old Grey Whistle Test have been unreleased until now. The Strange Fruit tracks make their CD debut here. Although critically well received, The End sold poorly and Nico was dropped by Island; she wouldn’t get another recording contract for almost a decade, recording only two further studio albums before her death in 1988. 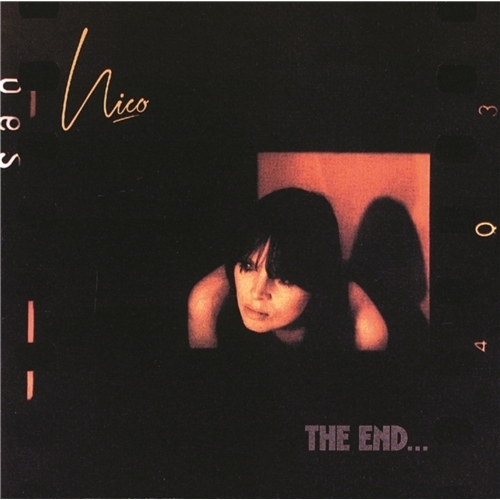 The End remains one of Nico’s most remarkable records and brilliantly complements her two previous solo albums produced by John Cale. This trilogy undoubtedly represents Nico’s best work, a unique statement from an artist with an uncompromising musical vision.